Which Volcano is the World's Largest? Three volcanoes share this title. Tamu Massif is the most massive. Mauna Kea is the tallest. Ojos del Salado is the highest. Map of World's Largest Volcanoes: This map shows the locations of the world's largest volcanoes. 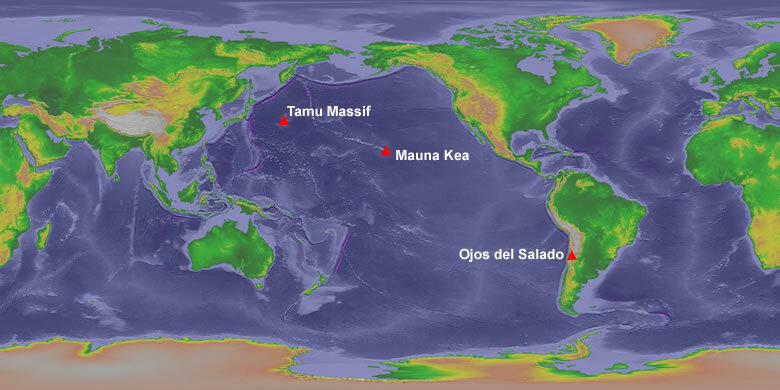 Tamu Massif on the Shatsky Rise in the northwest Pacific Ocean has the greatest mass and the largest footprint. Mauna Kea on the island of Hawaii has the greatest height from base to summit. Ojos del Salado in the Andes mountain range on the border between Argentina and Chile has the highest summit elevation. 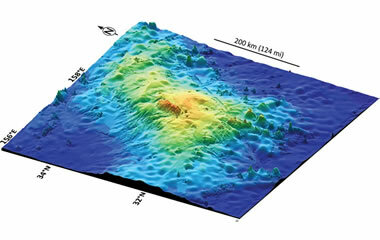 Tamu Massif: The "Most Massive Volcano"
Tamu Massif - largest volcano: Seafloor 3-D image shows size and shape of Tamu Massif, Earth's largest single volcano. Image by Will Sager, National Science Foundation. Most of the world's largest features are so clearly visible that they have been known and recognized for hundreds of years. One exception is Tamu Massif. It is now recognized to be a single volcano - instead of a volcano complex with multiple vents. Tamu Massif has a footprint that covers more area than any other volcano - about 120,000 square miles (310,800 square kilometers) - an area about the size of New Mexico. It also has a larger mass than any other known single volcano on Earth. How could this enormous volcano have escaped recognition until 2013? 1) Remote Location: Tamu Massif is located in a remote part of the northwestern Pacific Ocean about 1000 miles (1609 kilometers) east of Japan. Its summit is over 6500 feet (2000 meters) below sea level. This remote location and great depth made it very difficult to collect information about the volcano. For decades, researchers knew more about the large volcanoes on Mars than they knew about Tamu Massif. 2) Not an Obvious Mountain: Most volcanoes are an obvious "mountain," but the slopes of Tamu Massif are very gentle. Just below the summit, the slope of the volcano is less than one degree. Near the base of the volcano, the slope is less than one-half degree. It is not a volcano that abruptly and steeply climbs skyward from the seafloor. 3) Tamu Massif Fooled Scientists: They knew that Tamu Massif was a volcanic mountain; however, they assumed that it was a volcanic complex made up of multiple volcanoes that had merged together. It was not until seismic data revealed that its many lava flows emerged from a single vent, and geochemical analysis revealed that the lava flows had similar compositions and were approximately the same age. Tamu Massif is the largest volcano on Earth - unless an even larger volcano remains to be discovered on the deep ocean floor. Mauna Kea: The "Tallest Volcano"
Tallest mountain and volcano: The base of Mauna Kea is about 19,685 feet below sea level (6000 meters), and the summit is about 13,796 feet above sea level (4205 meters). The vertical distance between the foot of the mountain and the summit is over 10,000 meters. This makes Mauna Kea the "tallest" mountain in the world and also the tallest volcano. Mauna Kea satellite view: Satellite view of the island of Hawaii. The two snow caps are Mauna Loa (center) and Mauna Kea (to the north). Image by NASA. Mauna Kea is a volcano on the island of Hawaii. The summit of Mauna Kea has an elevation of 13,796 feet (4205 meters); however, the base of the volcano is about 19,685 feet (6000 meters) below sea level. If we measure from the base of the volcano on the ocean floor to the summit of the volcano, Mauna Kea is over 33,000 feet tall. This makes Mauna Kea taller than any other volcano on Earth. In fact, it is also the world's tallest mountain. Mauna Kea - Tallest volcano: The summit of Mauna Kea holds other distinctions. In addition to being the summit of the world's "tallest" mountain, it is also the home of the world's largest astronomical observatory. At an elevation of nearly 14,000 feet above sea level, the observatory is above 40% of Earth's atmosphere. The atmosphere above the mountain is extremely dry and almost cloud free. This makes it an ideal location for an observatory. And, yes, that is snow on the ground in Hawaii - the altitude is high enough and cold enough to accumulate snow. Photo copyright iStockphoto / GeorgeBurba. 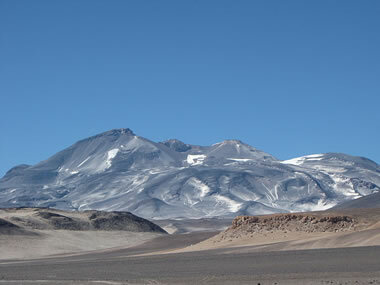 Ojos del Salado: The "Highest Summit Elevation"
Photograph of Ojos del Salado, the volcano with the highest summit elevation (22,615 feet / 6893 meters), located in the Andes Mountains and straddling the border between Chile and Argentina. Photo by sergejf, used here under a Creative Commons license. There is one more extreme that a volcano can attain. That is the volcano with the highest summit elevation. That distinction goes to Ojos del Salado, a stratovolcano in the Andes Mountains that straddles the border between Chile and Argentina (The mountain has two summits; the higher summit is in Chile). It has an elevation of 22,615 feet (6893 meters). It is also the second-highest mountain in the Western Hemisphere, the second-highest in the Southern Hemisphere, and the highest mountain in Chile. Ojos del Salado is considered to be an active volcano. The caldera contains several craters, cones, and lava domes and has been the source of Holocene lava flows. About 1000 to 1500 years ago, an explosive eruption produced pyroclastic flows. The most recent activity was a minor gas and ash emission in 1993 which was reported by local people but unconfirmed by a volcanologist.